In the story, the father says a thank-you for the day every day, to Mother Earth and to Father Sky. “Like his Indian friends – singers and storytellers – Dad believes that the things of nature a gift,” London writes. While he explains his philosophy, they stroll through some amazing scenery. A raccoon scurries as they walk under purple clouds. And as the sky turns blue, a tiny frog hides in the tall grass. It’s the illustrations that really give the story its visual impact. 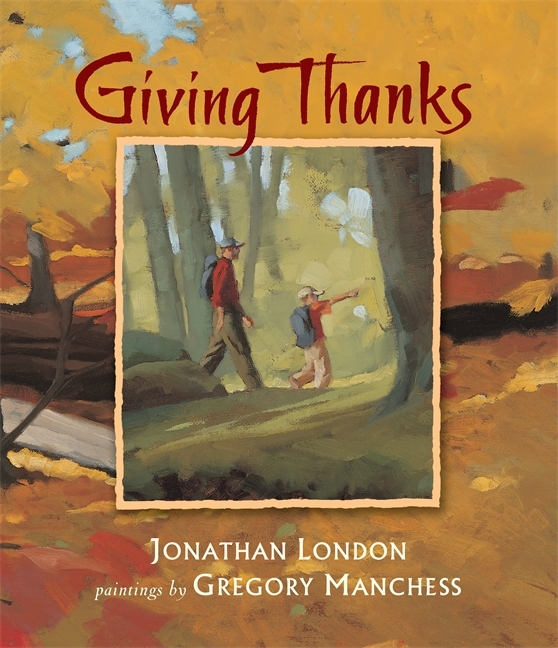 (On the book’s jacket Manchess is identified as a “self-taught illustrator,” and I found myself wondering if that gave his pictures an extra wildness.) Gregory Manchess is like an impressionist Edward Hopper, capturing the light and shadows on the house and the trees around it, while using soft edges to suggest the shapes. He contributes a gorgeous watercolor for the title page – with swatches of yellow-white representing the clouds at sunset, covering a purple sky. The color scheme continues on the next page, where those colors are now covered by the dark-green silhouettes of a pine tree’s leaf, and the amber horizon of a hill is visible in the background, and at its base is a row of distant trees. The father says a thank you to “the wild mushrooms that smell like pumpkins.” He thanks the trees, with their spectacular red and yellow autumn foliage. There’s an exciting drawing of a fox leaping off over a yellow field. There’s tracks of a deer, and a flock of scattering quails – and the father thanks them all. Though it’s a simple story, it keeps getting more and more interesting, thanks to Machess’s imaginative illustrations. When London mentions a hawk, “high in the sky,” Manchess switches to a panoramic aerial view, with the hawk’s wings in the foreground and a yellow forest beneath. In the next illustration, it’s just the yellow of the sunset, and the hawk is disappearing among the last clouds. But then there’s a spectacular moonrise over an ancient and twisted tree. And then the father gives thanks to the moon.